All of Southwest Florida from Naples to Sarasota. Venice, Sarasota, Boca Grande, Punta Gorda, Port Charlotte, North Port, Englewood, Sanabel, Cape Coral, Fort Myers, Fort Myers Beach, Bonita Springs, Estero, Marco Island and Naples Florida. 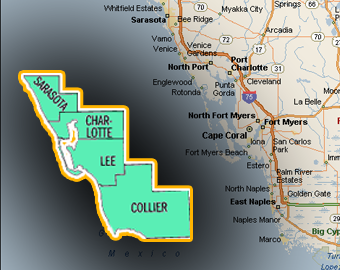 Florida Counties include: Sarasota County, Charlotte County, Lee County and Collier County Florida. Service area: Sarasota County, Charlotte County, Lee County and Collier County Florida. Home Inspections for: Venice, Sarasota, Boca Grande, Punta Gorda, Port Charlotte, North Port, Englewood, Sanabel, Cape Coral, Fort Myers, Fort Myers Beach, Bonita Springs, Estero, Marco Island and Naples Florida.